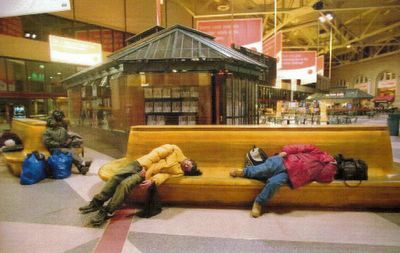 All around the former elementary school teacher, who was seated primly at 3 a.m. in South Station, limp bodies hung over wooden benches. Other people curled in nearby corners, hacking and snoring, and several moved about, as if walking in their sleep. A few blocks away in a Downtown Crossing doorway, beneath a heap of blankets, a 40-year-old pregnant woman and her 39-year-old fiance cuddled and told each other their dreams of a wallpapered room in a new home for their coming child. Around the same time, next to several makeshift huts under the Southeast Expressway, a 53-year-old refugee from the Congo shivered in a newly bought tent. A musician who speaks six languages and last year painted houses for a living, he nodded to the dozen candles by his bed and said: "They don't do much to keep out the cold." With the mercury hovering around zero - a temperature so extreme it drew tears, numbed the hands and feet, and induced dizziness, a few of the dozens of people who manage to live in Boston without shelter explained how they survived on one of the coldest nights of the year, from dusk Wednesday to dawn yesterday. Some kept warm by pacing nonstop throughout the city. Others huddled beneath blankets in bank vestibules near ATM machines. Still more rode trains and buses for as long as possible, nodded off in movie theaters, or spent their few dollars getting high in a bar. Why don't they seek refuge? The answers include pride and resistance to asking for help, fear of assault or robbery, a belief that shelters are rife with vermin and disease, and a dislike of crowded places. A record number of homeless residents did seek a bed in state shelters in the first two weeks of this month, as the city's homeless population reaches its highest levels ever. For Mary, the former teacher, who wouldn't give her age or last name, staying on the streets is about maintaining her independence - and not compromising her principles. "A shelter would seem like captivity to me," said the grandmotherly woman. "I would rather take my chances with the elements, but that doesn't mean I'm mentally ill or suicidal. On the contrary, I want to be comfortable like anyone else." For at least the past five years, she has lived on the streets of Boston. A pink-cheeked woman who favors tea and crossword puzzles, she roams from downtown doorways to benches in the Prudential Center to the aisles of thrift shops and Wal-Mart. On particularly cold days, she rides the T for a while and spends nights either at ATM machines or South Station, where security guards let the homeless rest. Yesterday she spent the wee hours there with the others. "It's surprising how you can develop a psychological toughness to a lot of little problems in life," she said. "I never thought I would be able to endure being cold, hungry, and not having a place of my own to go to at night, especially when it's so cold." With "a little less" than $1,000 a month in either a pension or public aid - she won't say where her money comes from - the warmly dressed former Quincy resident said she always keeps enough money on her to hop a Greyhound bus, if necessary, to stay warm. To keep out of the cold, she said, she has taken winter trips to Seattle and to Jacksonville, Fla. And once a week, she takes the bus to Foxwoods in Connecticut, where she whiles away her time on the quarter slot machines. "I won't allow myself to lose more than $5," she said. But her insistence on such strict self-reliance, she acknowledges, has its shortcomings. Despite a master's degree in education from Boston State College - now UMass-Boston - she said she cannot afford all the books she would like, her own TV, or good dental care. So why doesn't she seek public housing or look for an apartment she might afford? "There are a lot of personal, complicated explanations," she said, sitting cross-legged on a wooden bench, wearing a new parka, ski pants, wool socks, and sturdy winter shoes. "But unless I had two broken arms and legs, I wouldn't return to a shelter." Both C.J. Charles and his fiancee, Jessica - awakened in the morning by office workers heading to 1 Milk St. - relied on body warmth, multiple layers, and blankets to keep from freezing. "I would describe a night here as North Pole-cold," said Charles, a onetime gas station attendant from Mattapan who has been homeless off and on for the past 16 years. Jessica, who wouldn't give her last name, added: "It's terrible living like this, but we force ourselves to go on." The couple offered cigarettes and a seat on their "bed" to strangers at around 4:30 a.m. yesterday, and said they plan to get married and that they've applied for public housing. But even with a baby due in five months, the two insist it would be more dangerous for them to trade a night on the streets for one in a shelter. "My experience in shelters was lice, roaches, and crabs," said Charles, who last month moved with Jessica to Milk Street from the Boston Common, where they had run-ins with raccoons and would get soaked whenever it rained or snowed. At the shelter, "the food they serve needs to change. I mean, chicken six times a week?" The couple now survives by hustling. A woman recently gave them a $500 check, they said, and they decided to spend the night at a hotel. Despite the risk of frostbite, which can take hold within minutes in bitter weather, Charles said: "No matter what, I feel safer here than in the shelters." Bernard Tshimangoley, the Congolese refugee, lost his house painting job a year ago because of back trouble, and drove from Portland, Maine, to Boston in his Hyundai sedan to look for work. But since arriving here, he hasn't found a job. "No one would hire me," he said, "and I'm very humiliated to be in this situation." A few weeks ago, despite the cold spell, Tshimangoley decided to move out of a Boston shelter and take his chances living in a tent. The singer, who said he spends his time composing songs when not searching for public housing, believes the shelter where he stayed was making him sick. And, now, living just a few yards from where an elderly man died in the cold this week, he does his best to keep warm, dozing next to rows of burning candles and the hotplate he uses as his kitchen. "It's really quite cold," he said, near dawn, "but at least I'm not sick."